Mooroopna is a provincial township on the western side of the Goulburn River, immediately adjoining Shepparton. It is thought that the name derives from an Aboriginal word meaning deep water. The township did not arise from a government survey, but was sold as private allotments by W.S. Archer, who settled on a small farm there in about 1860. The subdivision of pastoral runs for farm selections in the early 1870s was stimulus for the sale of town lots by Archer in 1874. Mooroopna drew ahead of Shepparton until the railway line was taken through the latter. Schools were opened at Mooroopna (1873), Mooroopna North (1874) and Mooroopna North West (1878). 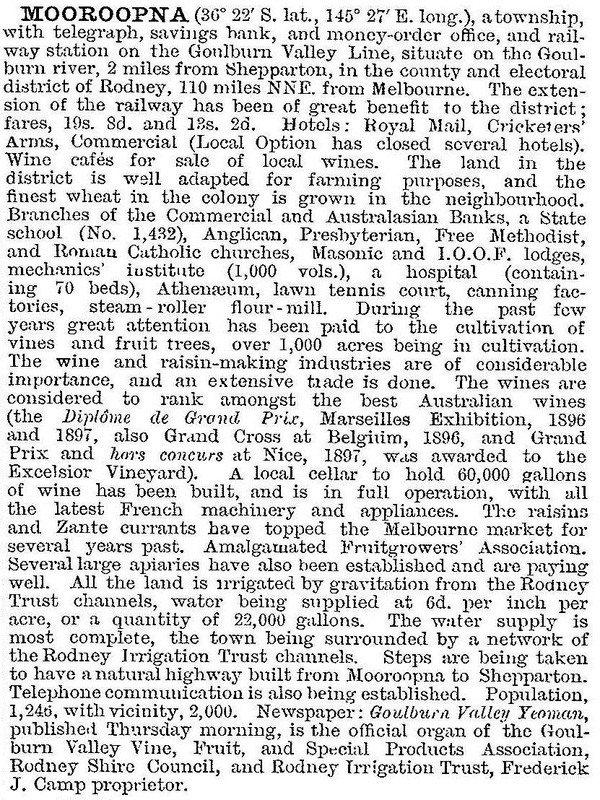 Mooroopna farm selections were used for vineyards and orchards (Darveniza’s Excelsior Winery dates from 1871), but the district supported a strong wheat industry until irrigation became more widespread after the Waranga Basin (1909) was completed. The Mooroopna Flour Mill (1878) continued until the 1970s and was converted for the production of animal feed products. The handbook omitted mention of the Mooroopna Hospital (1877) which in 1943 became the Mooroopna and District Base Hospital, and established an enviable reputation in the region. During the interwar period Mooroopna’s population growth was modest, the main growth factor being the opening of the Ardmona fruit cannery in 1922. Timber milling gradually declined, ending in 1988. Shepparton overshadowed Mooroopna and in 1960 the Chamber of Commerce unsuccessfully promoted the prospect of Mooroopna being severed from Rodney shire and united with Shepparton city. Since the 1976 census the two have been treated as a unified urban area, and in 1994 Mooroopna was incorporated in the Greater Shepparton city. Mooroopna has a high school (1972), three State primary schools (including Mooroopna North), a Catholic school, three churches, two halls, senior citizens’ and community club facilities, a swimming pool, a large and well appointed recreation reserve, and a golf course. The main industry is the SPC Ardmona fruit cannery. Although the owners Coca Cola Amatil announced in 2011 that it would close, it remained open with state government support. In 2014 the company announced a new direction and a new product – a healthy, soft-serve frozen fruit snack to be manufactured at the Mooroopna factory. There is a caravan park near the Goulburn River, mainly for fruit industry employees, and the Mooroopna Common southwards along the river. A larger caravan park is on the Midland Highway, with many permanent sites.